Attracting thousands of away fans all the way from Brighton to Middlesbrough, and Cardiff to Ipswich, Rotherham United has become the latest organisation to back "Visit Rotherham." www.VisitRotherham.com launched last year and aims to bring together information for people wanting to visit the area, inform Rotherham residents of interesting places to visit that they may not have considered before and provide a resource for businesses who may receive requests for recommended places to visit in the area. 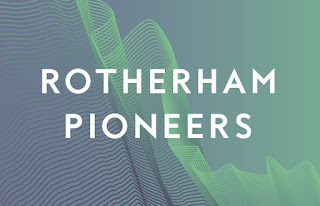 Featuring information on events, attractions, hotels, retail and restaurants, support for Visit Rotherham is provided by Barnsley and Rotherham Chamber of Commerce and Rotherham Metropolitan Borough Council. 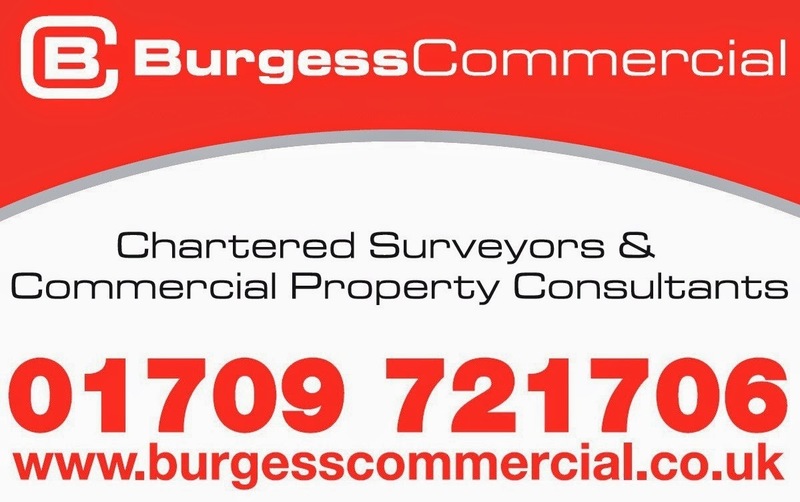 The borough's Championship club play in the £20m AESSEAL New York Stadium which attracts average attendances of around 10,000 and has played a big part in boosting the footfall figures in Rotherham town centre. 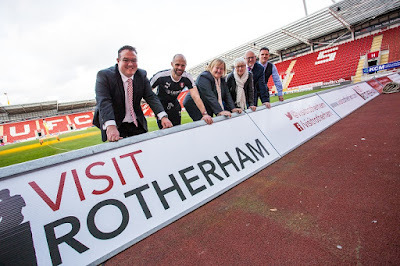 Rotherham United has now kindly donated over 180 ft in pitch board space to Visit Rotherham and put their weight behind the project, with the cost of the production of the boards covered by Chamber subsidiary, Rotherham Enterprise Agency. Steve Coakley, commercial director at Rotherham United (pictured, far right), said: "It is important for us a club to support this project. We attract numerous visitors to our town through away followings and we want them not only to visit the AESSEAL New York Stadium, but stay and enjoy the great things Rotherham has to offer visitors." Mark Hannigan, operations manager at Barnsley and Rotherham Chamber of Commerce (pictured, far left), added: "To have the support of Rotherham United for Visit Rotherham is huge and the opportunity to get the brand exposure to the many people who follow their team is something only this unique opportunity can provide." The visitor economy is a key part of the recently approved Rotherham Growth Plan with the potential Gulliver's Valley theme park at Rother Valley and the Yorkshire Man of Steel picked out as priority projects. 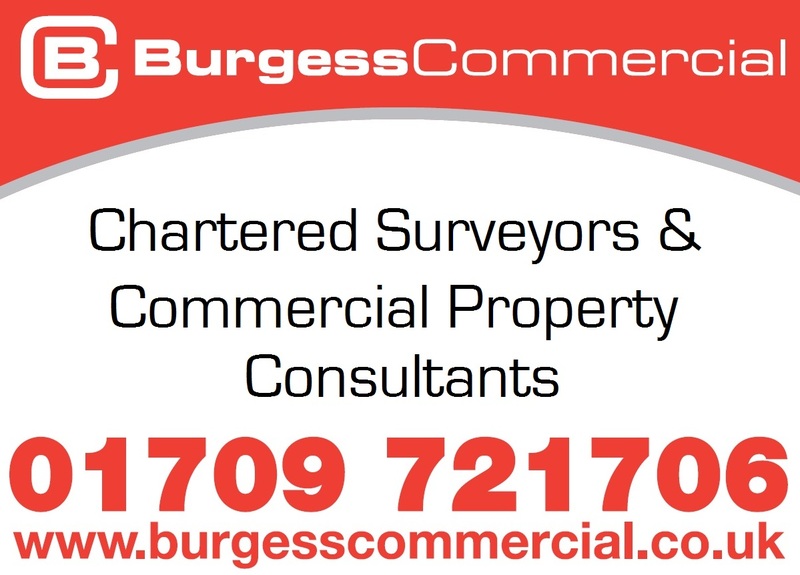 New corporate plans also stress the importance of giving a bigger profile to culture, heritage, tourism and sport in Rotherham and a proposed reorganisation of the council's regeneration and environment directorate will see a new assistant director for culture, sport and tourism put in place. Bringing together services such as libraries, leisure and sport development, plus tourism and events, a report to be approved by councillors outlines that: "this new service would be the flag – bearer for a new vision of Rotherham with a focus not just on its past heritage but on vibrancy now and for the future as a place for arts, culture and leisure. One of the key issues in relation to these functions is that their promotion relies heavily on external partnerships and funding and building relationships with governmental and non-governmental bodies is critical and this would be a key role of the new assistant director post." Should the boards not be facing the away fans who this should be promoted to - rather than the home fans. Logical thinking.